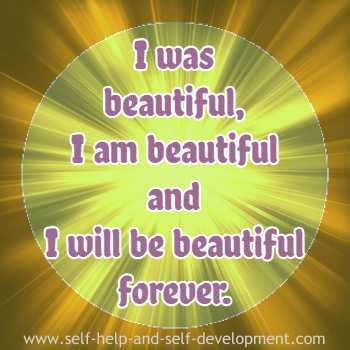 Beauty affirmations will make you beautiful, no matter how you are now. Who does not want to be beautiful? We all do. Unfortunately we don’t realise that we all are indeed beautiful from the inside but our real beauty is covered with the dust and grime of wrong thoughts, wrong deeds, bad life experiences and such things. Our mind needs a cleansing so that the real inner beauty comes out and we become beautiful externally also. Beauty affirmations is the soap that does this cleansing. How is beauty defined? Is it the olive skin or dusky smooth skin or fair or dark skin? Is it a straight nose, blue or green eyes, long or short black hair or some other physical characteristic? Universally, beauty cannot be described by a single set of external physical characteristics. What is beautiful in one part of the world may not be so in another part or civilization. It is clear that it is possible to be beautiful without possessing the so called standard beauty parameters. One scintillating example is the ageless Bollywood diva Rekha. Forty years ago when Rekha entered the Hindi film industry she looked like a glorified junior artiste. She also drew nasty comments about her diction, sense of dressing and loud acting. In a few years she had transformed herself into a stunning diva, without any plastic surgery. And she has always maintained that the change in her was mainly due to the change in her thinking. And so have also said many Hollywood beauties. There is a saying “Beautiful is as beautiful does.” In the modern context we can say “Beautiful is as beautiful thinks”. 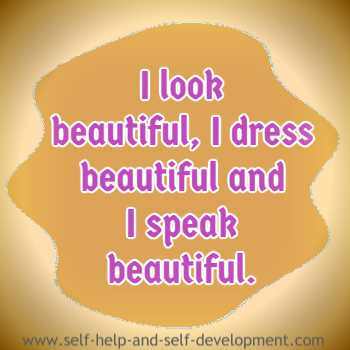 Beauty affirmations help you think beautifully. It is a fact that not only are your thoughts radiated but they are also exhibited on your face and body. Constantly holding bad thoughts like anger, jealousy, sadness, etc. or wishing bad for somebody or imagining bad things happening to others brings about certain chemical changes in the body that are not only harmful to the body but also change the contours and lines on the face so that it looks unpleasant. 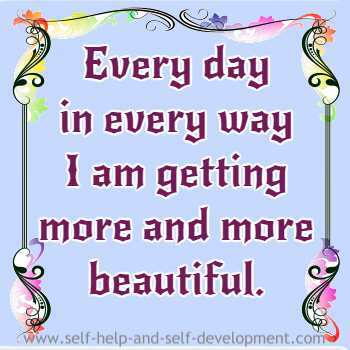 Saying beauty affirmations a number of times everyday will help you change this habit. Similarly, if you are a thinker of good and happy thoughts, if you always wish well of others, if you always imagine good things happening to others, then you radiate goodness all around you and your facial lines and contours change to reflect the goodness within you. People then start liking you and you start appearing beautiful to them. Constantly telling yourself about your beauty, about life’s beauty and the beauty you find everywhere will change you from the inside out. You will not only become a good person but also a beautiful person. The following beauty affirmations are precisely for that purpose. I am getting more and more beautiful. 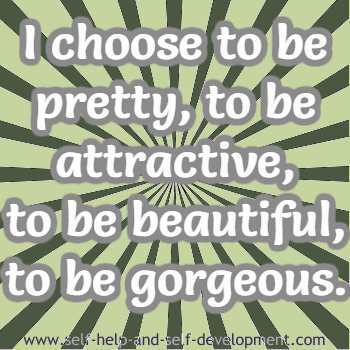 I choose to be pretty, to be attractive, to be beautiful, to be gorgeous. I was beautiful, I am beautiful and I will be beautiful forever. 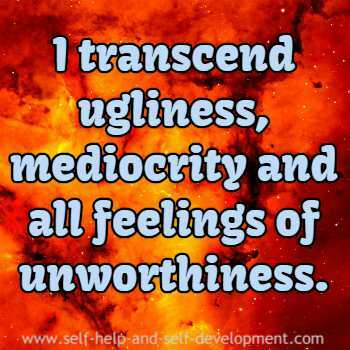 I transcend ugliness, mediocrity and all feelings of unworthiness. 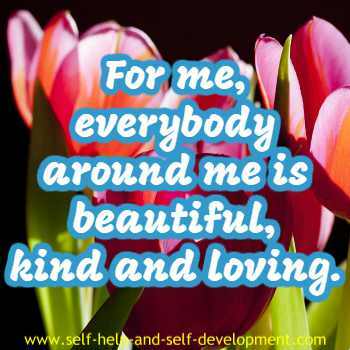 For me, everybody around me is beautiful, kind and loving. 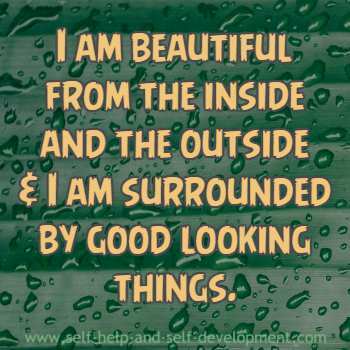 I am beautiful from the inside and the outside and I am surrounded by good looking things. 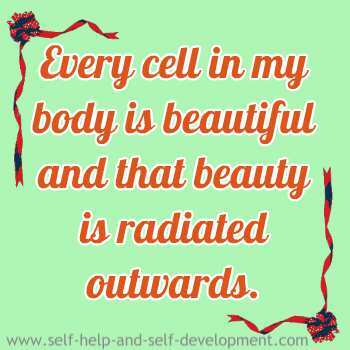 Every cell in my body is beautiful and that beauty is radiated outwards. 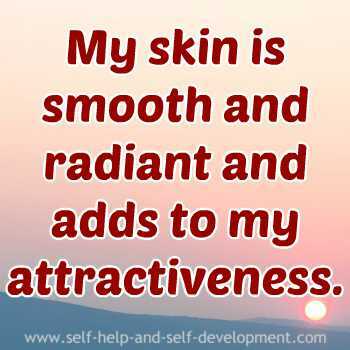 My skin is smooth and radiant and adds to my attractiveness. My hair are smooth and silky and very attractive. I have an erect posture and carry myself very well. 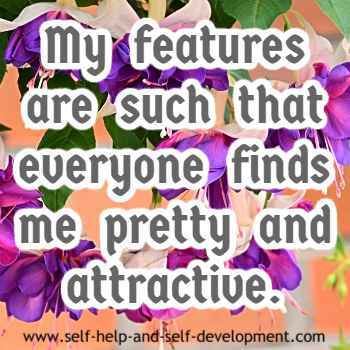 My features are such that everyone finds me pretty and attractive. I have a sweet and melodious voice which everyone loves. I carry positive thoughts which make me appear gorgeous. I walk gracefully and carry myself elegantly. My inner happiness results in my charming and irresistible personality. I always see at the bright side of things and that brightness shows on my face. I have a radiant smile which captivates everyone’s heart. I am beautiful as well as healthy. I love myself, my body and life. I care for myself as well as for everybody around me. And this makes me more beautiful. I let the world see me as per the high worth that I set on myself. My makeup is always perfectly applied and is neither light nor gaudy. My beauty is enhanced by my choice of perfect lipstick colour. I wear my jewellery sensibly so as to add to my beauty without distraction. I love my body and care for it by eating the right kind of food. I let go of all reasons and excuses for not looking and feeling beautiful. Beauty and I are one. I always dress sharp and choose colors that enhance my beauty. I only eat food that enhances my skin and overall beauty. Beauty is as beauty does. I only take actions that are good for everybody. I realise that beauty is only skin deep. So I try to be beautiful from the inside also. I am beautiful. Everyone is beautiful.